Does This Glacier Have Wifi? Does this glacier have wifi? That kind of question is serious business for Tina Pidgeon, who spoke to us on the sidelines of the Wilson Center-Arctic Circle Forum. A top executive at GCI, one of Alaska’s leading telecommunications companies, she described the challenges of achieving connectivity in an unforgiving environment and the growing importance of doing so as the Arctic hotspot of global attention. “The looming crisis in the Arctic is a preview of the looming crisis of the global condition.” This is the stark prophecy of Mark Brzezinski, a top Arctic official in the Obama White House, a former U.S. ambassador to Sweden, and the son of the late Zbigniew Brzezinski. 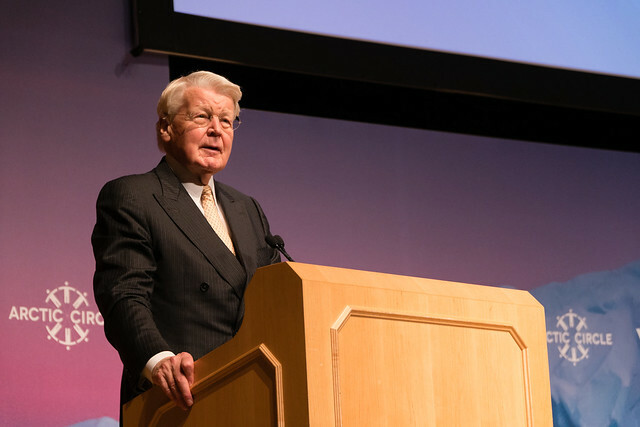 On the sidelines of the Wilson Center-Arctic Circle Forum, he described the challenge — and the urgency — of communicating the Arctic to Americans, as well as the region’s vulnerability to being politicized, its often-overlooked social issues, and his father’s Arctic prescience. U.S. Senator Lisa Murkowski (R-Alaska) was a keynote speaker at the Wilson Center-Arctic Circle Forum on June 21, 2017. On the same day, she published this article in The Hill. WASHINGTON — The Woodrow Wilson Center announced today that Dr. Michael Sfraga will be the new director of the center’s revitalized Polar Initiative.